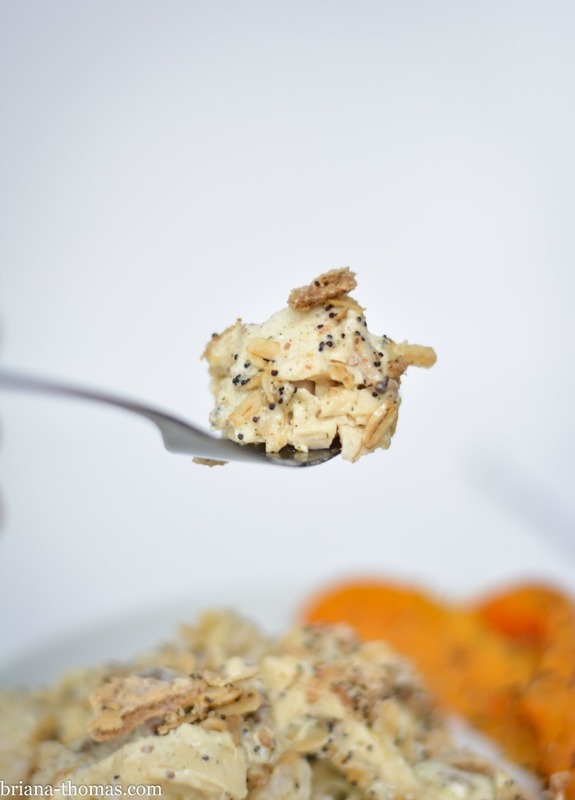 Poppy seed chicken casserole has been one of our family favorites for years. 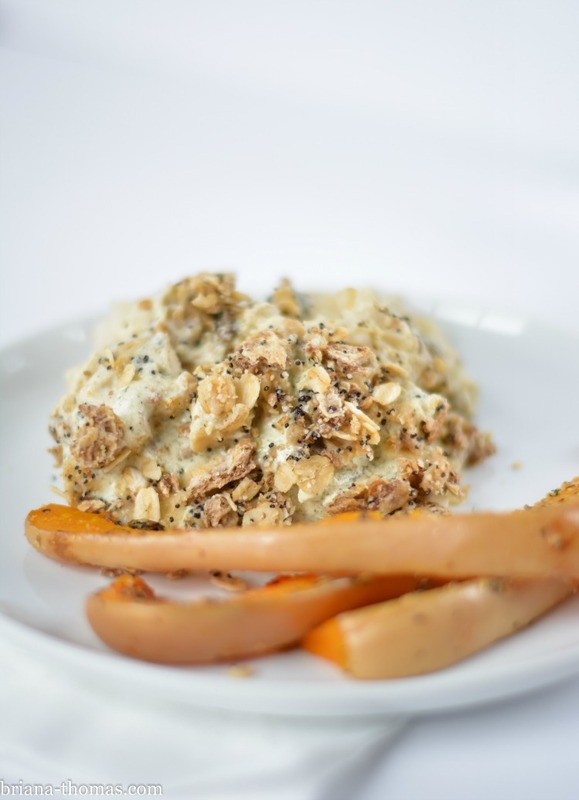 It’s chicken with a creamy sauce (made of sour cream and cream of mushroom soup) baked in a casserole dish and topped with crumbs made of Ritz crackers, butter, and poppy seeds. Very easy, yummy comfort food. Comfort food with serious issues, like all the junk in that canned soup, not to mention the blood-sugar-spiking crackers and a tremendous fuel collision between the copious amounts of butter and the carbs from said crackers. But it sure was good, and I missed it. So I healthified it. The recipe you see here has brown rice in it because for some reason I thought our traditional recipe had rice in it. I had my brown rice on to boil an hour early, and then I decided to look at the recipe I was revamping. No rice. “Oh well,” I thought, “we Trim Healthy Mamas always need more (E)nergizing meal options.” Someday I might do a (S)atisfying version of this casserole without the rice – and add puddles of butter and all that good stuff. ‘Cause we can do that. (Not to say that this version isn’t satisfying, because it totally is, even without the fat). This creamy casserole is very easy to make, especially if you keep cooked brown rice and cubed chicken breast on hand. I bet you could even freeze this casserole for later use. I would just reserve the crumbs separately and put them on right before baking so they don’t get soggy. 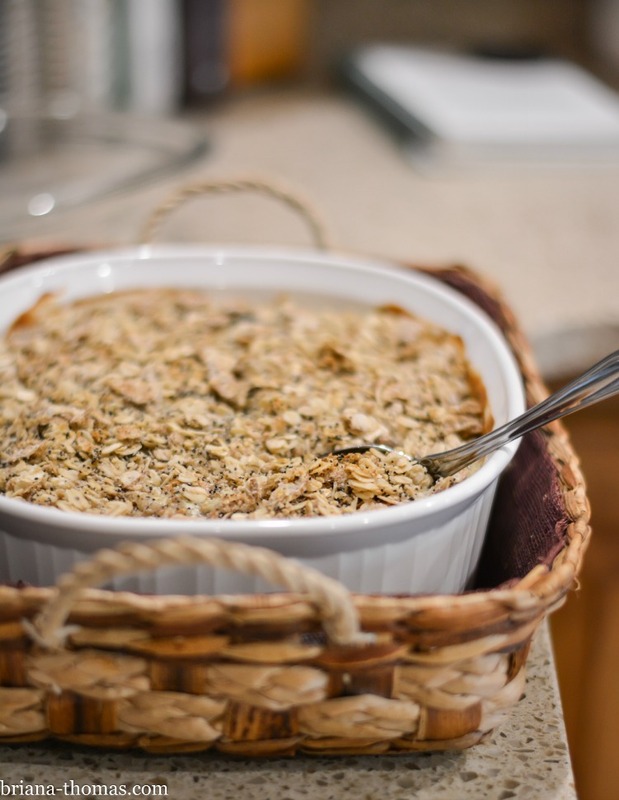 There are trace amounts of fat in this from the low-fat dairy and the tablespoon of butter in the crumbs, but spread out among so many servings (this feeds 8-10 or more people), this stays well within Trim Healthy Mama E guidelines (less than 5 grams of fat per serving). I served this casserole with some cooked beans and roasted butternut squash (you can see how I did this in the “Notes” section of the recipe below). Need E dessert ideas? Check out this page! Please note that if you decide to pair this casserole, which already contains some rice, with an E dessert that’s fairly heavy in carbs, you’ll want to keep your side dishes to non-starchy vegetables so you don’t give your body more carbs than it can handle at once. Question of the day (comment below): what’s your family’s favorite traditional casserole? Have you healthified it? You can pin this post from my THM E Meals board here. PS – have you liked my Facebook page yet? That’s a great way to keep up with my recipes as well as other random stuff I post! Place the cooked rice in the bottom of a casserole dish (mine measured approx. 10½" x 8½" x 4"). Blend together all the sauce ingredients except for the Greek yogurt/sour cream and chopped mushrooms until smooth. Mix together the blended mixture, Greek yogurt/sour cream, mushrooms, and chicken. Spread over rice. Stir the crumb ingredients together with a fork until combined. Spread over the top of the casserole. Bake uncovered at 350 degrees F for 30 minutes or until warmed through. Leftovers can be reheated in the oven, no problem (cover with tinfoil). I've served this with roasted butternut squash. Yum! I sliced the squash (I didn't even peel it) in half, scooped out the seeds, then cut the squash into strips lengthwise. Place on a greased cookie sheet, spray lightly with cooking spray of choice, then season. I used garlic salt, dill weed, black pepper, and parmesan cheese from the green shake container (it's low-fat). Bake with the casserole (it may need a little over 30 minutes to become tender). The trace amounts of fat from the low-fat dairy and butter in this recipe stay well within THM:E guidelines (<5 g/serving). I used my Ninja single-serve blender cup to make the sauce for this recipe. I use that cup for everything. Okay, this might sound like a dumb question, but are we talking about Chicken Bouillon as in the powder, or are we talking about chicken broth liquid? The powder kind. 🙂 Actually, what I use is more of a paste, but it’s the super concentrated powder/paste/cubes that you add liquid to in order to make broth. I use Better than Bouillon from Walmart or other local grocery stores. Going to try this tonight! 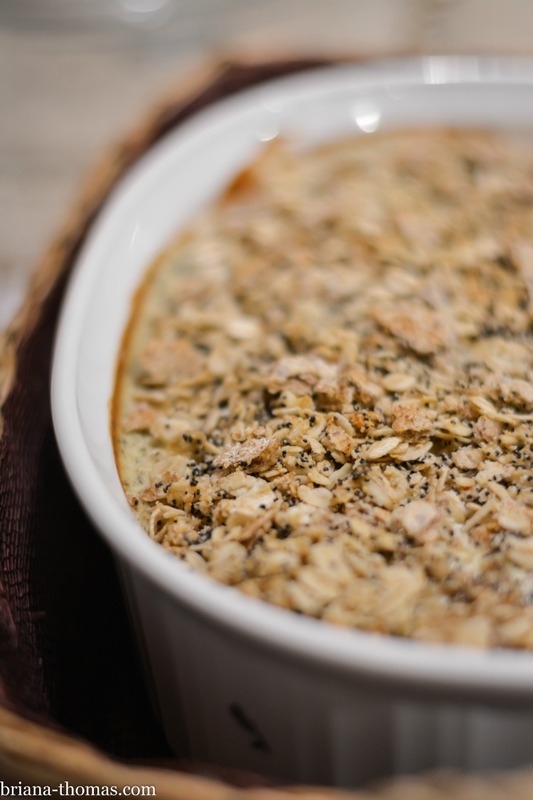 One of my family’s favorite recipes was Poppyseed Chicken before THM… now I get to try this one! Thank you Briana! We love your recipes!! Briana, have you tried the Fage 0% Greek Yogurt? Do you find that it has a tang? I’ve tried several brands and know exactly what you mean about a tang, but I don’t notice it with the Fage. I’m wondering if it has a tang for you. This got a big thumbs up from my hubby (and me!). All I had on hand was regular fat free Greek yogurt from the store and it was just fine. We paired with green beans. It was hard to not eat two servings instead of one. I’m so glad y’all enjoyed it, Rachel! Any suggestions on a sub for the mushrooms? I can’t think of any mushroom-like substitutions, but you can always leave them out. One of my kids has a nut allergy. What could I use in place of the almond milk? So yummy! My husband and I loved this. Made it last night and looking forward to left overs. 🙂 Thanks! Keep ’em coming! We lived in the upstate for three years. My hubby being from New Jersey and myself bring from Florida, we had never had this casserole until we moved there. Every time someone had a baby, was sick, you moved into a new house, etc etc someone would bring this casserole!! It was One of my favorite things when we were there. It’s going on the dinner rotation for next week! Can’t wait!! I have missed this casserole since going on THM 3 years ago, so thank you for sharing this recipe! Could you replace the brown rice with quinoa? I’ve never tried that, Carina, but I assume that it would work. Just made a half-sized version of this dish for my husband and me. Wondering if I should bake it now and reheat for dinner, or can I put in refrigerator and bake when ready to have dinner? Looking forward to trying, and thank you for an E meal casserole. I would bake it now, then reheat. I am so excited to try this recipe. May I ask if the carb count will put me too high if I just get 8 portions out of it? Do you have an idea on the carb count? I am wondering if I could add some fruit to round out the meal and don’t want to go over those 45 carbs on an E. 😉 Thanks! Thank you so much! This is one of my family’s absolute favorites, and I was thinking about how I could THMify it… so glad that’s already been done! I can’t wait for your “S” version! You have no idea how excited I am to find this recipe. This is (was) one of our favorite casseroles. Since trying to stick to thm I have made it occasionally for my family but its almost impossible for me to keep out of it. My 3 children all like this casserole. Thank you so much for this. I feel like I am not good at.converting recipes so thank you very much!!!! Could wild rice be used instead of brown rice? Hi Julie! I haven’t done any experimenting with wild rice, but I don’t see why it wouldn’t work. Please note that if you’re following the Trim Healthy Mama lifestyle like a lot of my readers are, wild rice would not be on plan. This is one of our favorites! So excited to try it in THM friendly form! I think I’ll probably half it for just me and the hubs. One of our favorite casseroles is hashbrown casserole (frequently referred to as funeral potatoes around my family!) and I’m thinking I can make a pretty close version with cauliflower…I’ll see how it goes! I made this with a bit of trepidation as a fellow THMer made it and told me she was less than thrilled. Actually, said her family didn’t like it all and she really didn’t like the dry crumbly topping. BUT . . . the story doesn’t end here. I told her I was going to make a half recipe of it this morning to have for lunch and would let her know my results. I only had dried mushrooms and half as much sour cream as I needed. Not one to be deterred, (or tricked into going to the market again) I rehydrated the mushrooms and used half sour cream and half plain Greek yogurt. I also sprinkled a bit of smoked paprika (just because I love it) with the chicken mixture. The whole time this was baking I was thinking how good something that smells so good not taste good? Finally, the baking time was over and I may or may not have tasted a teaspoonful from the corner of the pan while it was still very hot. I also may or may not have eaten “lunch” at 10:15 simply because it had been four hours since breakfast. I TOTALLY LOVE IT! This will go on my rotation of delicious E meals. 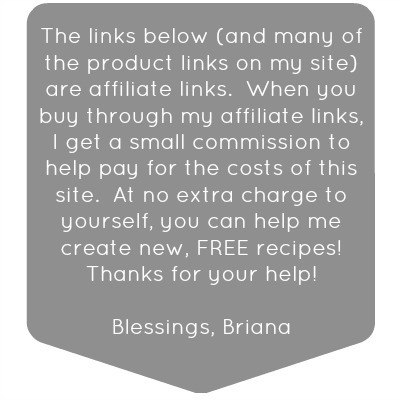 Briana, your recipes are so good and I thank you for taking the time to write this blog filled with yummy recipes. God bless! Thank you for all of the wonderful rexipes . how do I pin them to save them ? To pin the recipes, click the “Pin it” button that appears when you hover over any of the images. Also, I usually have a link to a pin somewhere in the post (often right above the recipe). Thanks Brianna! I look forward to trying this healthier version of one of our favorites soon! Sounds yummy! I may even try the squash. 🙂 Blessings! This was one of our family’s favorites pre-THM and I’d thought about playing around with it, but just hadn’t takent eh time… I’m making this tomorrow night for dinner, and I’m pretty sure our kiddos will be cheering! How can you say THM is healthy when they say you can use a bunch of crappy food like 1/3 less fat cream cheese, stuff like that that has been processed more?? First off, you don’t have to use any of that if you’re not comfortable doing so. Second, “healthy” is largely a matter of personal choice…you have to draw your line somewhere, and mine happens to be drawn before 1/3 less fat cream cheese. Somewhere along the line you have to make a judgement of how close to the source you’re going to go; you’re doing this as well unless you produce everything single thing you eat yourself. Trim Healthy Mama is definitely a healthier way of eating than most diets (ways of eating) out there and promotes unprocessed foods. How far you go with that is up to you, which leaves this plan open to more people. very wise and gracious response, briana. 🙂 so thankful for all the work you are doing to help create these recipes. i pray God blesses you richly for it, as your work has blessed SO many out there already! My favorite casserole is green bean casserole. We haven’t THMified it yet, but I’m sure I will get around to it soon. Thanks for sharing this delicious recipe! Oooh, when you do be sure to post it somewhere and let me know. Sounds wonderful!